Every month, we take a look at what’s onstage at Shakespeare theaters across America. In September, we take a look at an all-female Richard III and a Restoration Macbeth, visit rehearsals for plays opening later this month in Annapolis, Chicago, Omaha, and Dallas, and catch the final performances of some great shows from this summer. 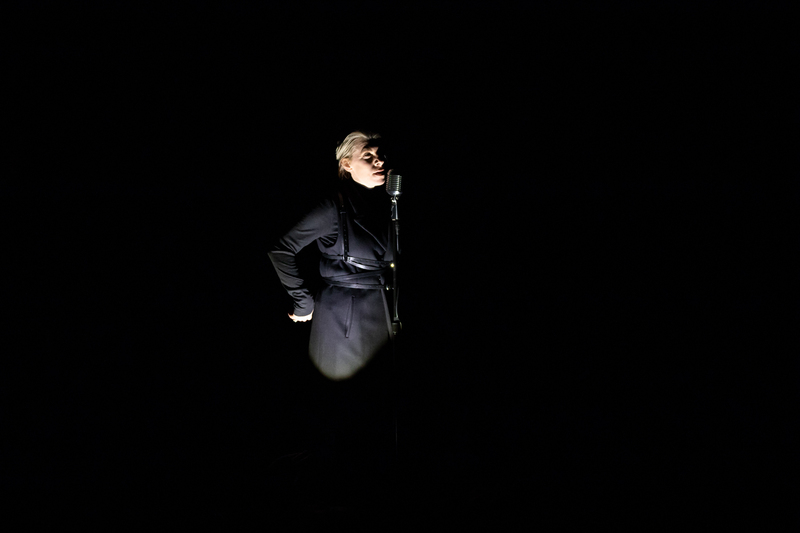 Sarah Harlett as Richard III and Suzanne Bouchard as Buckingham. “Richard III” at Seattle Shakespeare Company. Photo by HMMM Productions. Betsy Schwartz as Elizabeth, Peggy Gannon as Edward IV, and Sarah Harlett as Richard III. “Richard III” at Seattle Shakespeare Company, 2018. Photo by HMMM Productions. At the Seattle Shakespeare Company, Richard III is onstage through October 7. 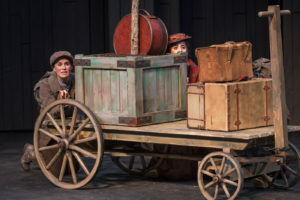 Last year, the Seattle Shakespeare Company teamed up with the artists from upstart crow collective to stage Bring Down the House, a two-part, all-female adaptation of Shakespeare’s Henry VI trilogy—of that production, Seattle Weekly reviewer Becs Richards wrote that “seeing an all-female production of a Shakespeare play carries a kind of magic that straight Shakespeare plays lack.” Now, the project culminates in an all-female Richard III. Owen Peakes in “Macbeth.” Adapted by Sir William Davenant. A joint production of Folger Theatre, Folger Consort, and Performing Restoration Shakespeare, 2018. Directed by Robert Richmond. Photo by Brittany Diliberto. Rachel Montgomery, Ethan Watermeier, Emily Noël, and Louis Butelli in “Macbeth.” Adapted by Sir William Davenant. A joint production of Folger Theatre, Folger Consort, and Performing Restoration Shakespeare, 2018. Directed by Robert Richmond. Photo by Brittany Diliberto. Kate Eastwood Norris as Lady Macbeth in “Macbeth.” Adapted by Sir William Davenant. A joint production of Folger Theatre, Folger Consort, and Performing Restoration Shakespeare, 2018. Directed by Robert Richmond. Photo by Brittany Diliberto. Here at the Folger, we’re staging Macbeth as it hasn’t been seen in generations—a recreation of a Restoration adaptation of the play by Sir William Davenant, first staged in 1664 and widely popular into the 18th century. It’s a joint undertaking of Folger Theatre, Folger Consort, and Queen’s University Belfast’s Performing Restoration Shakespeare project. “The Comedy of Errors” at Annapolis Shakespeare Company. Photo by Joshua McKerrow. 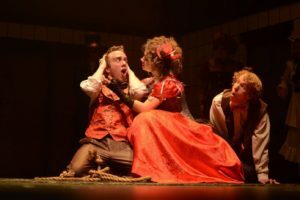 At the Annapolis Shakespeare Company, The Comedy of Errors is re-imagined in fin de siècle Paris with steampunk design and a time-travel twist. The production starts on September 28. Jessica Swale’s hit Nell Gwynn gets its American premier at the Chicago Shakespeare Theater on September 20. This rom-com-bio-play tells the story of Restoration-era actress Nell Gwynn, whose quick wit and exceptional beauty propel her from selling oranges on the streets of London’s burgeoning theater district to performing on its stages. 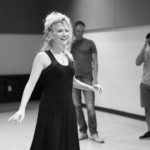 Scarlett Strallen (Nell) rehearses for “Nell Gwynn” at the Chicago Shakespeare Theater. Photo by Joe Mazza. Shakespeare Dallas’s 2018 Shakespeare in the Park production is Othello, opening September 19. Katie Becker-Colón as Bottom, Sarah Vishnev as Titania, and Abrahma Ntonya as Puck in “A Midsummer Night’s Dream” at Nebraska Shakespeare Festival, 2018. 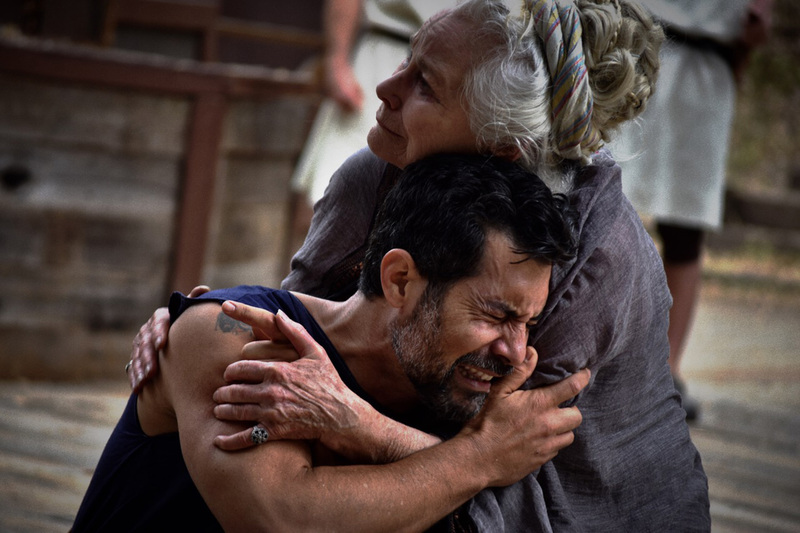 David DeSantos and Ellen Geer in Theatricum Botanicum’s “Coriolanus.” Photo: Ian Flanders. There’s still time to see some of this summer’s great Shakespeare productions. Catch the San Francisco Shakespeare Festival’s free A Midsummer Night’s Dream in San Francisco’s McLaren Park through September 23. Coriolanus, at Will Geer’s Theatricum Botanicum, has its final performances on September 15 and 23. The Chalk Garden, The Crucible, and Haiti continue through September. At Wisconsin’s American Players Theatre, As You Like It and Measure for Measure both continue into October. If you’re in the mood for a little George Bernard Shaw, Heartbreak House, in an adaptation by Folger Theatre Artistic Associate Aaron Posner, is onstage through October 5. Melisa Pereyra and Andrea San Miguel, American Players Theatre’s “As You Like It.” Photo: Liz Lauren. At the Oregon Shakespeare Festival, Othello, Henry V, Romeo and Juliet, Love’s Labor’s Lost, Lauren Gunderson’s The Book of Will, and more run into October. At the Utah Shakespeare Festival, Othello continues through October 13. The Annapolis Shakespeare Company, Chicago Shakespeare Theater, Nebraska Shakespeare Festival, Oregon Shakespeare Festival, San Francisco Shakespeare Festival, Seattle Shakespeare Company, Shakespeare Dallas, Utah Shakespeare Festival, and Will Geer’s Theatricum Botanicum are theater partners of the Folger Shakespeare Library.